This project is supported by Engineering and Physical Sciences Research Council (EPSRC) in the UK and National Natural Science Foundation of China (NSFC). It has five UK academic partners and three Chinese partners. It will study lithium battery cell development and degradation under Vehicle to Grid (V2G) operation and investigate grid scale energy storage, from a battery perspective upwards and not from a network level downwards. This project will study lithium battery cell development and Vehicle to Grid (V2G) operation to investigate grid scale energy storage, from a battery perspective upwards and not from a network level downwards. 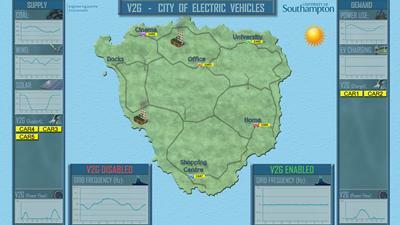 As a part of the project, a simulator was developed in Southampton University using MATLAB GUI to investigate the impact of integration of electric vehicles (EVs) in the power system, and find out the impact of their Vehicle to Grid (V2G) operation. The final consortium meeting was held on 22-23 of November 2016 at the University of Southampton. A workshop entitled ‘Smart Grids, Clever Vehicles: connecting electric vehicles to the Grid’ was organised by Southampton University partners of ‘BaChMan’ consortium. More than 50 delegates from UK and China attended the workshop, which took place on 21st of April 2016 at Grand Harbour hotel Southampton. The fifth meeting of this project was held on 16th of March 2016 at Strathclyde University. The minutes from this meeting are available via the SharePoint link on this page. The Rt Hon Greg Clark MP, Minister of State for Universities, Science and Cities, visited Southampton University on 20th November 2014. Professor Andrew Cruden explained our activities within the consortium in the field of Battery characterisation and management and V2G modelling for the minister who was accompanied by EPSRC CEO, professor Philip Nelson. The third meeting of this project was held on 24th of November 2014 at Warwick University. The minutes from this meeting are available via the SharePoint link on this page. Universities Week 2014 was launched on Monday 9 June 2014 at the Natural History Museum in London where a week-long public event showcased our AC Cobra Electric car and Interactive V2G Demonstrator.